Can we all agree anyone who has to tell you he is smart, probably is not? Can we all agree, just by holding a press conference President Obama showed up Donald Trump, who has not held an organized press conference since July? Can we all agree it can’t be a coincidence the Presidential press conference was held on the same day Mr. Trump promised he would detail his plans to clarify his business dealings while in office? Did Mr. Trump think we would forget? 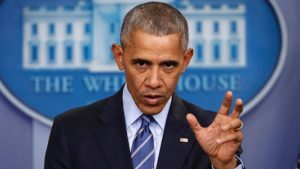 Can we all agree Mr. Obama’s ‘measured but firm’ response to the Russian’s hack of the election process is far better than Mr. Trump’s false tweets attacking the President? Can we all agree Attorney General Loretta Lynch’s speech on race relations should be required reading? Can we all agree, it’s about time Hillary Clinton rejoined the debate? Can we all agree it’s telling that James Comey’s FBI took months to come to the same conclusion the CIA did, about Russia’s involvement in our electoral process? Can we all agree China’s capture of a Navy drone cannot be a coincidence after Mr. Trump’s ill timed communication with the president of Taiwan? Can we all agree it’s also possible the Chinese are just trying to divert attention from new reports that they have installed weapons on the artificial islands they created in the South China Sea? Can we all agree the GOP establishment must really want Rex Tillerson to be Secretary of State, since they are pulling out all the stops to convince key senators that his clear conflict of interest will not sway his judgement? Can we all agree, new rumors that it may take Britain 10 years to negotiate an exit from the European Union make a mockery of the whole process? Can we all agree the British kerfuffle over Theresa May’s wardrobe would be funny, if it were not based on sexism? Can we all agree that Ivanka Trump as first lady seems to be a foregone conclusion, although it’s hard to understand why she is sitting in meetings with her father – unless she will have a voice in policy? Can we all agree it’s remarkable that Mr. Trump’s security advisor, who has released classified information will be allowed to serve in the government, while Mrs. Clinton who has never released government secrets, will not? Can we all agree it make no difference what Mr. Trump tells the people who are summoned to Trump Tower to pay homage to him? His overall policy will be made by the people he is appointing to key positions – like the ambassador to Israel or the oil and gas company interests who will have unequalled influence over the next four years? Can we all agree the irony of Rick Perry heading the Department of Energy, is just too obvious? Can we all agree, the thought of the President-elect facing a deposition in a court case, just two weeks before his inauguration is a clear embarrassment to the office and every citizen? Can we all agree that Mr. Trump seems to realize he went too far in trying to argue with the CIA over Russian interference in the election? Can we all agree, it was a surprise to hear the Senate Majority leader break with Trump and agree to hold hearings on the Russian interference in our election? Can we all agree it’s nice to see the Democrats are planning to use the same strategy to slow drown Mr. Trump, as the GOP has used to prevent Mr. Obama’s policies – lawsuits? Can we all agree it is tragic that scientists feel the need to copy all their research and statistics to protect them from the incoming administration? Can we all agree that we never thought divide and conquer would apply to the United States on so many levels? Can we all agree California’s Governor has the right idea about resistance to the Trump administration’s climate change agenda? Can we all agree the Minnesota football team’s threat to boycott a bowl game over sexual assault charges against teammates, makes you think twice about what’s happening on college campuses? Can we all agree Mark Zuckerberg should be ashamed of his attitude toward fake news that influenced the election through Facebook? Especially now that he’s making it the responsibility of his users to stop it. Can we all agree, speaking of fake news and college, it seems clear that if adults cannot figure out what’s fake, young people have no chance? Can we all agree, it wasn’t that long ago that generic drug makers were supposed to be a force to keep drug prices low? Now they are being accused of price collusion to inflate prices. Can we all agree the reaction of the North Carolina legislature and sitting governor are wrong on so many levels, it’s hard to believe they are not taking place in some third world country? 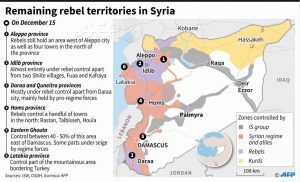 Map of Syria, confirms that the fighting will not end even after Aleppo falls. Can we all agree the Federal Reserve’s action to raise interest rates, just proves what a remarkable job President Obama has done over the last 8 years? Can we all agree the world has failed the people of Aleppo? Can we all agree Uber did itself no PR favors by ignoring state law and trying to start using driverless cars before getting the correct permits? Their contention that there will be someone sitting in the driver’s seat, does not hold water. Can we all agree The EPA is trying to make fracking more difficult for the incoming administration by concluding that the process can damage drinking water? Can we all agree, speaking of fracking, it seems there are some times when Mr. Tillerson actually opposes it – like when it gets too close to his home? Can we all agree General Motors went way too far in advertising for neo-nazi’s to appear in their next commercial? This week’s heartbreaking great read comes to us courtesy of Alex Trebeck and Jeopardy. and RIP, TNT basketball reporter Craig Sager and former TV dad Alan Thicke.